We received a super cool package in the post last week for review in the shape of the Fisher Price Smart Stages Crawl Around Car. The Smart Stages is a brand new range of toys from Fisher Price allowing babies and toddlers to explore the world in an innovative way. There is 3 stages to the Crawl Around Car starting at 6 months, 12 months and 18 months. The toy adapts the older the child gets by changing the settings with the manual switch to Level 1, 2 or 3. Level 1 is for when babies are learning their first words and experiences feedback. Level 2 is encouragement in building on learning and level 3 is role play. It's actually much bigger than I expected, we had to build the car from the pieces provided which was very easy. You are given stickers to put on certain parts of the car once it's built (my alphabet may be a bit lopsided though!) I left it on the living room floor for Luke to see in the morning, well it was like Santa had been early. He is delighted with it. He spent ages figuring it all out and testing all of the buttons to hear what they say. I think his favourite is turning the key as if to start the car. My favourite is the windscreen wiper on the front that changes from night to day and from sunshine to rain. There's a door on the left hand side that opens and closes very easily, Luke is all business when he gets in and shuts the door behind him. On the door also is 3 shape inserts, a circle, square and triangle with the corresponding shapes. Luke is flying it with putting the right shapes into the right insert, he gives himself a big clap after each one. He spent much of the first day figuring that out. On the other side is an insert for 3 balls to go into and they roll down a slope, this keeps him very entertained. He then likes to throw them out, run after them and out them in from the opposite side again. There's a little petrol cap that makes noise when you turn it and the wheels are slightly off the floor so he loves to turn them around and have look at the stickers on them. It's light enough for Luke to move it around the floor by himself. Every morning so far it's the first thing he goes for, there's so many features on it to keep him entertained and he's remembering the sounds each button or dial makes now. His other toys are a bit neglected although that suits me fine because he was beginning to enjoy emptying out the ball pond numerous times a day far too much! The car itself stores away quite neatly, while it's big it's not too big or an obstruction in the living room. 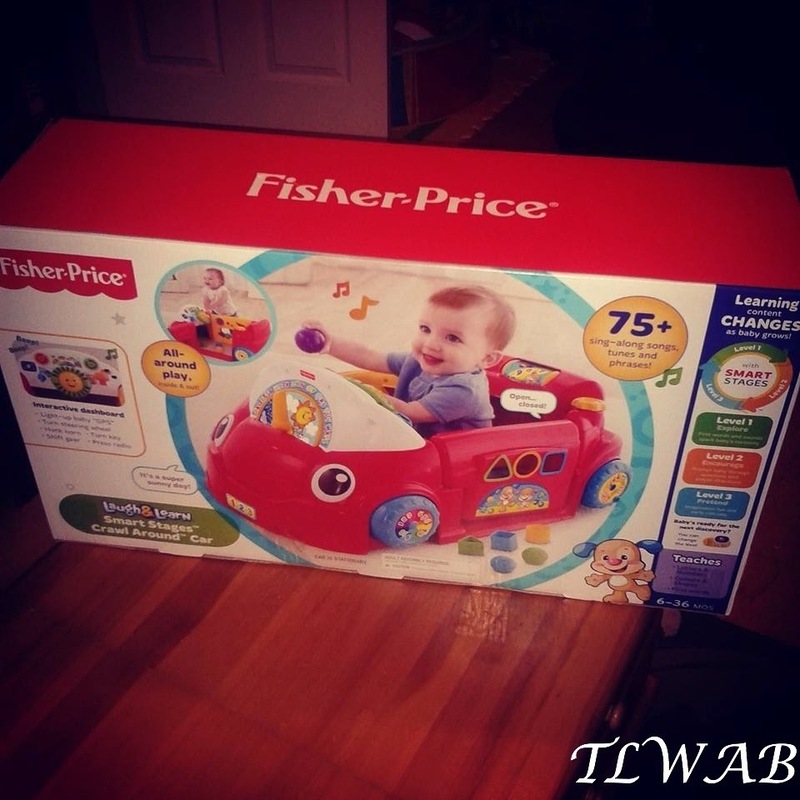 Here are a few snaps, we were very impressed with the Fisher Price Smart Stages Crawl Around Car.